Here in Boston, we have a sister diocese, the Eparchy of Newton for Melkite Catholics. 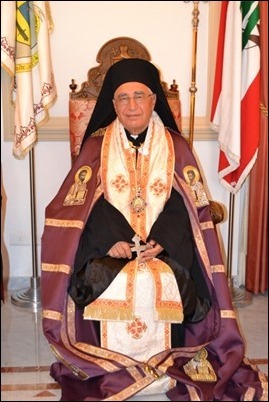 This past weekend, we were blessed to have Patriarch Youssef Absi, who was named patriarch just over a year ago, in the area as part of his visits to various Melkite communities in the Diaspora. He was here to have a Eucharist and celebration at the Melkite Cathedral in Newton. We were very happy to be able to greet him and to say how pleased we were that he was visiting. The Eastern Christians face great challenges in the Middle East because of persecution there. So, we want the patriarch, along with all the Christians in Lebanon and the Middle East, to feel our solidarity and prayerful support. 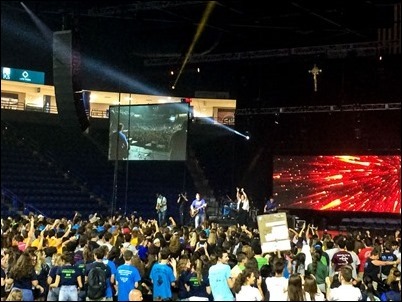 Sunday, I went to the Tsongas Arena at UMass Lowell to celebrate Mass for the young people gathered there for the Steubenville East conference. 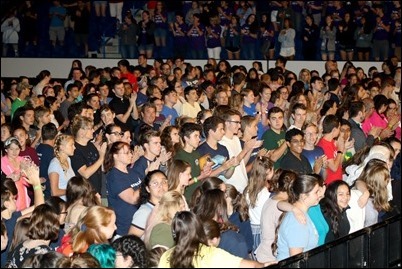 This is one of several such conferences organized around the country by the Franciscan University of Steubenville and in many places, including here in the archdiocese, by Life Teen. 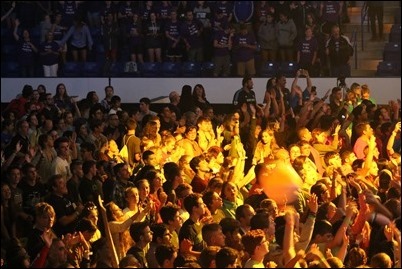 There were almost 3,000 young people with us for the very enthusiastic celebration. We were also joined by a large number of priests and deacons. I was very pleased they were able to be with us, even though it was a weekend. 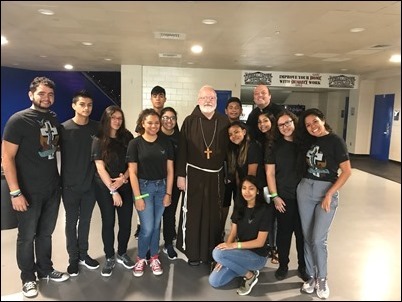 With a group of young people from St. Mary of the Annunciation Parish in Cambridge who were there with their pastor, Father Michael Harrington. The gospel of the day, of course, was about the sending of the disciples, and the gospel begins by Jesus summoning The Twelve. So, in my homily, I told the young people we had all been summoned here, we were not here by chance. I said that events like these are events of grace and, just as Jesus called the Disciples and sent them out, he also sends us out to bring the Good News to the world. Jesus prepares the disciples, telling them to have great trust in Him and not take all kinds of equipment and goods with them. He also tells them that sometimes the message will be rejected. In this, he is telling us that we should trust in him and not to be discouraged in the face of that rejection but continue in our mission of sharing our hope. I told them that we were there with a purpose and have a mission that Christ has entrusted to all of us — a call to discipleship. At the end of the Mass, there was a vocational call led by Father John Parks, one of the speakers at the conference who is from Phoenix, Arizona. Father Parks began speaking about the vocation of marriage. I was very struck when he told the young people to pray for their future spouse so that someday they will be able to tell the person they are going to marry, “I loved you even before I knew you.” He then invited all the married people in to stand and be recognized. 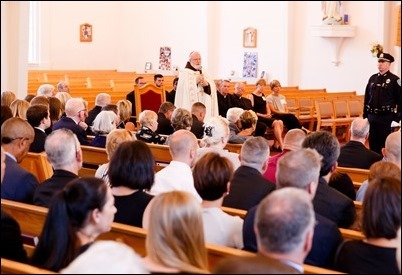 Afterward, he asked all the priests and religious women also to stand and receive the ovation of the people. Then, he invited young men to come forward who were open to the call to the priesthood. He did the same for young women open to the idea of religious life. Scores of young people came forward. 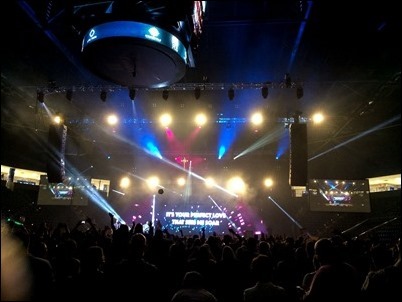 I must say, I have never seen a better altar call. I very much like the fact that he tied it in with marriage, which is, of course, the principal vocation of the Christian community, and it today’s world it is certainly under siege. It was very inspiring. Sunday night, I went to a farewell gathering for Arlene McNamee, who is leaving the area after being the director of Catholic Charities in Fall River for many years and participating with the Massachusetts Catholic Conference, which represents the four dioceses of Massachusetts on public policy issues. She did so much good as director of Catholic Charities — working to meet the basic needs of the poor, establishing programs for the homeless, working for the development of affordable housing, establishing a halfway house for women — just too many to mention. She had a great passion for the Social Gospel and the mission of the Church to serve the people on the periphery. She was one of my closest collaborators during my years in Fall River and has continued to be an important part of my ministry through her work with the Massachusetts Catholic Conference. She and her husband, Jim, are moving to Florida to be closer to their daughter who is expecting her fourth child — so the proud grandparents are going to be nearby! We wish them all the best! Wednesday, I was visited by Father Paul Hurley, the chief of chaplains for the United States Army, who is home visiting and came to say hello. Recently, he was the commencement speaker for St. Sebastian’s School in Needham, where his two twin nephews were graduating. They are the sons of Kevin Kiley who worked for the archdiocese for many years and is now the chancellor of the Fall River Diocese. The boys are going to have appointments to West Point where, at one point, Father Paul was the chaplain. 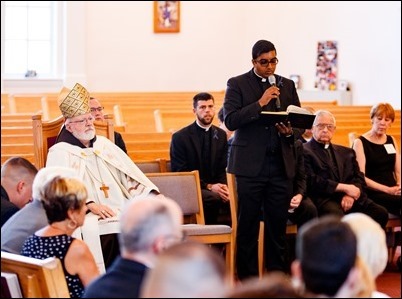 I had already heard about Father Paul’s very dramatic commencement address, which he began by apologizing for having been too busy to prepare the speech, and then sat down. Then, when everyone was just in shock and horror, he got up and gave a talk (which, of course, was prepared) on how important it is to be prepared for life and how our Catholic identity is an important part of that preparation for life. 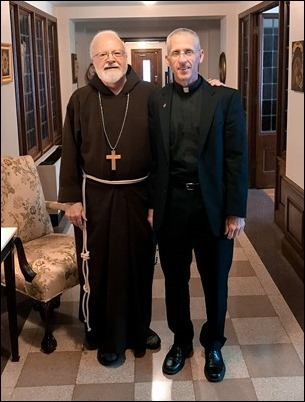 We are very proud of the great service that Father Paul has given, and the service that so many Boston priests have provided as chaplains of the Armed Forces. 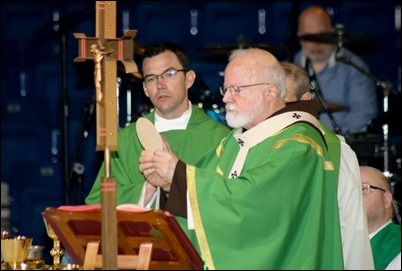 I only wish that more bishops would send men to serve with the Military Archdiocese, as there is always a great need for Catholic priests to serve as military chaplains. Their period of service in the military is such an important time in the lives of young people, and we want them to feel close to the Church and the ministry of our priests. Thursday morning, I was visited by Sister Catherine Mary Norris and Sister Nancy Murphy of the provincial leadership of the Daughters of Charity of Saint Vincent de Paul, along with Sister Barbara Curran, who is the aunt of Father Jim DiPerri and a member of the Daughter’s community in Holbrook. 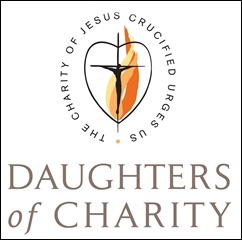 We have four Daughters of Charity working in the archdiocese but, because of the restructuring of their province, they are being recalled. 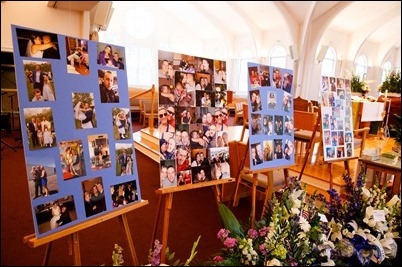 The Daughters have worked in the Archdiocese of Boston for more than a century. 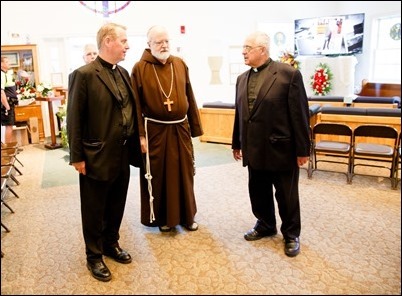 They, of course, founded Labouré College, Carney Hospital, and many other wonderful works, and have also been involved in education, healthcare and social services in the archdiocese. We are very sorry to see them leave and hope that perhaps someday they will be able to open a new mission in our archdiocese. That, however, does not gainsay the great sense of gratitude we have for their many accomplishments and for the witness of their lives and ministry among us. 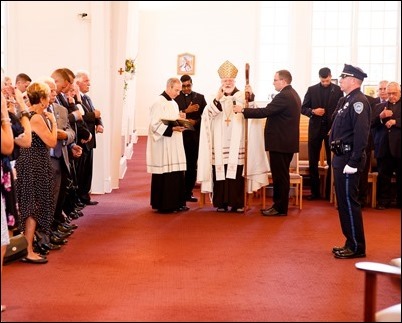 Then Thursday afternoon, I went to St. Mary’s Church in Hanover to preside over the Rite of the Reception of the Body of Weymouth police officer Sgt. 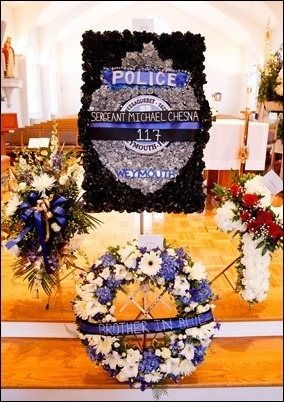 Michael Chesna, who was brutally murdered in the line of duty. Sgt. Chesna has two small children, one of whom recently made her First Communion at St. Mary’s. 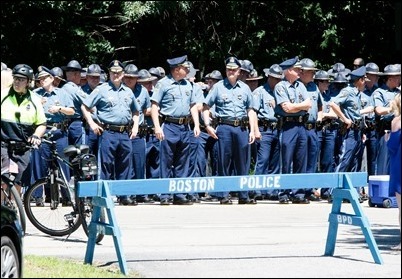 We are very grateful for the wonderful ministry that Father Chris Hickey has provided to Officer Chesna’s family, friends and fellow officers during this exceptionally difficult time. There are also three seminarians at the parish from St. John’s Seminary. I think it is very valuable for them to have had the opportunity to participate in this type of event and have an understanding of the importance of this ministry in the midst of tragedy. 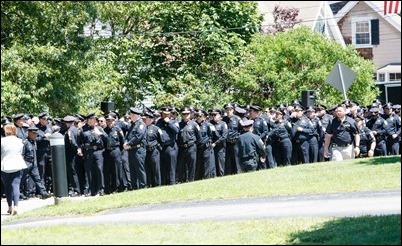 The service, of course, brought together hundreds, if not thousands, of law enforcement officers from around the area and beyond. We pledge our prayers and ask for the prayers of the community for his wife Cindy, his children and the whole family during this very difficult moment in their lives.